Didn't get enough Cover explanation, or wondering about those fringe cases? Well wonder no more! A couple of weeks ago, I looked at just how dang complicated cover can be. This resonated with a lot of people, and I had a few very helpful folks on Reddit and Facebook who (a) showed me one or two things I had done wrong and (b) gave me some examples of even more complicated cover scenarios they’d like to see explained. So here we are, with Advanced Cover! Without further ado, let’s dive through FIVE (count ’em, five!) more examples of how cover works, in these extra confusing instances. Many thanks to Reddit users ATT_Turan and TheEclecticGamer in particular. 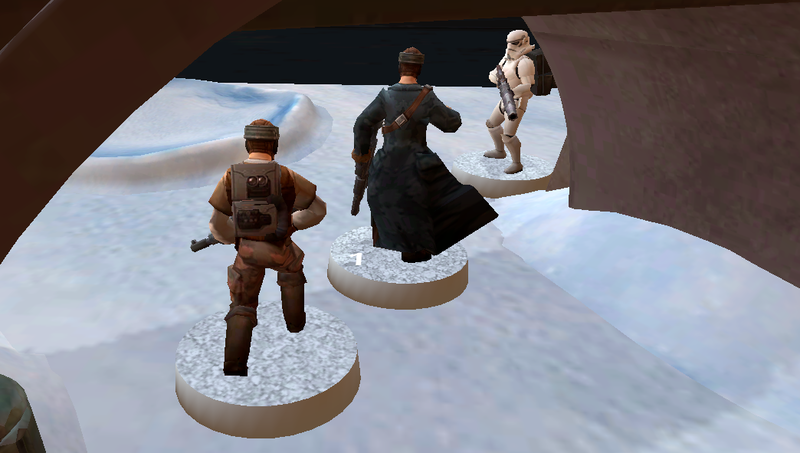 The Stormtrooper unit leader cannot see the Rebel troopers and is ineligible to shoot them. The leader is not touching the piece of terrain. 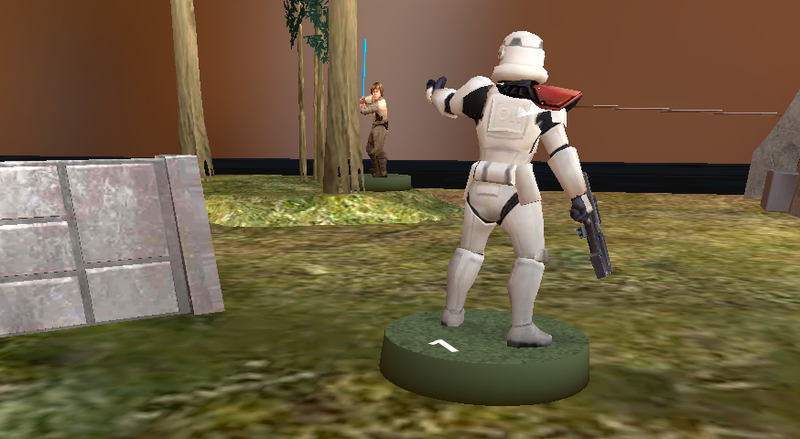 The DLT trooper, however, can see and therefore shoot the troopers. The obstructing building was decided before the match to give heavy cover. 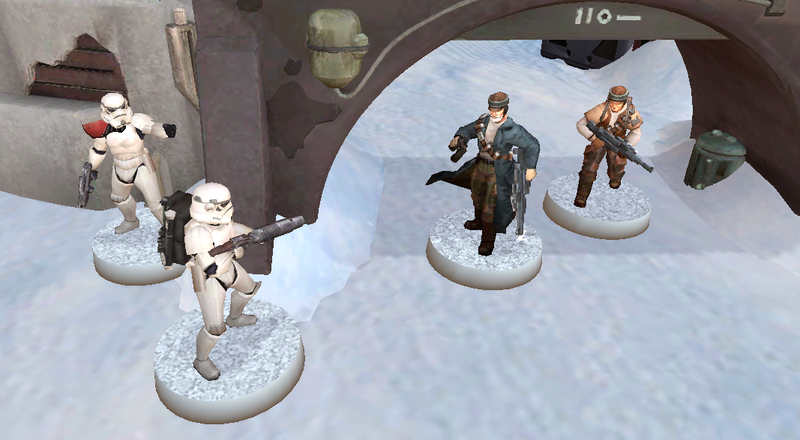 What kind of cover do the Rebel troopers have: no cover, or heavy cover? As we learned last time, obstruction is always determined from the unit leader. This applies regardless of whether or not they can participate in the attack. So despite the fact that the DLT trooper has a clear line of sight for their two red attack dice, the Rebel troopers are still granted heavy cover. Same scenario, but we flip sides. The entire Rebel trooper unit can see the DLT Stormtrooper without any obstructions. None of them can see the Stormtrooper unit leader, and therefore only the DLT trooper may be shot at. What kind of cover does the DLT trooper have: no cover, or heavy cover? The answer, once again: heavy cover. The rules as written do not presently make any exceptions for enemy minis who cannot be shot at. Therefore, since at least half of the Stormtrooper unit is sufficiently obscured per the rules, the totally exposed DLT trooper counter-intuitively has heavy cover for the impending attack. Let’s take a close look at this scenario, where Luke Skywalker is peaking out from behind a tree. Before the match, the players determined that the tree gives light cover. Luke’s base is partially obscured by the tree. What kind of cover does Luke have: no cover, or light cover? Clearly, Luke is obscured by the tree. But when we draw that imaginary line from the center of the Stormtrooper’s base to the center of Luke’s base, the line does not intersect with the tree. Therefore, Luke is not sufficiently hidden to earn light cover. Before the match, it was determined that the rocky hill provided heavy cover. These Rebel troopers are shooting at Veers, who is standing exposed on top of it. What kind of cover does Veers have: no cover, or heavy cover? When determining both parts of the cover check on an opposing mini that is higher than your own, the line of sight and base-to-base lines will frequently intersect with the terrain. Having the high ground is an advantage. Who’d have thought? This time, Luke is doing a poor job of hiding behind an X-Wing. 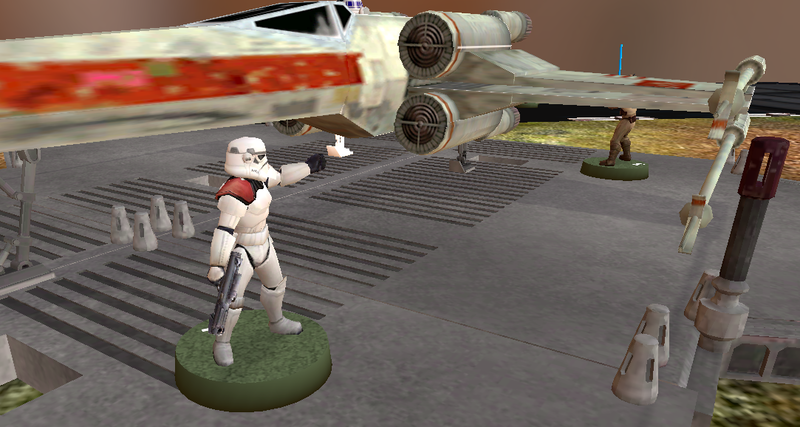 Before the match, the players determined the wing of the X-Wing should count as light cover if applicable. If any part of a defending mini, including its base, is blocked by a piece of terrain, the player then traces an imaginary line from the center of the base of the attacker’s unit leader to the center of the base of the defending mini. Which creates a question: is that line on the ground only, or is it a 3D plane, from a top-down view, encompassing terrain that is not in contact with the ground? While I believe the former is the correct case, there are arguments of ambiguity to be made for the latter as well. I posted about this on the FFG forums and Facebook (and had lengthy discussions on the Discord, so feel free to chime in on any of those), but until we have official word from FFG, you should talk this over with your opponent before the match starts if any applicable terrain (such as small arches or short catwalks) is present. Save yourself the headache. EDIT | NOVEMBER 20, 2018: The 11/20/18 rules reference update confirmed that LOS is drawn from a top-down view, as seen on page 25. I hope that you found this interesting or at the very least useful. Moving forward, you can just whip out this article (and the last one) whenever you’ve got in-game cover disputes and settle the score. I think youre confused as to how line of sight works. In example #1 no attack can me made from the stormtroopers to the rebels because LoS is always measured from the squad leader, and you clearly state that the squad leader has no LoS. Not quite! Range and cover are measured from the unit leader, but the unit leader doesn’t have to be able to see for the minis to shoot. There is no rule saying the unit leader *has to be able to see the enemy*. It just means their dice won’t be added to the pool. Can I please ask, in Example 4, in what way is Veers obscured? Is it because the base to base line will have to clip / travel through the outcrop in 3 dimensions? Great article. What about the opposite for Example 4 and Veers is shooting down on the troopers? I would assume this would be similar to the ATST example from the rule book and the troopers would get no cover. Thanks, Nick! You’re exactly right about the AT-ST. Since Veers would (presumably) not have any obstructions from his LOS, the troopers would get no cover.